APRIL 18, 2017—Despite the continuation of a three-year decline for average plastics compensation, plastics professionals are optimistic about the future, according to the 2017 Plastics Salary and Trends Survey, which reports earnings for the previous calendar year. Average total cash compensation (salaries plus bonuses and incentives) decreased 1% to $112,740 in 2017. 1,351 plastics professionals shared details about their 2016 compensation in the 2017 annual salary survey, conducted by Gros Executive Recruiters and the Society of Plastics Engineers. Average base salary dropped 2.1% to $96,804. 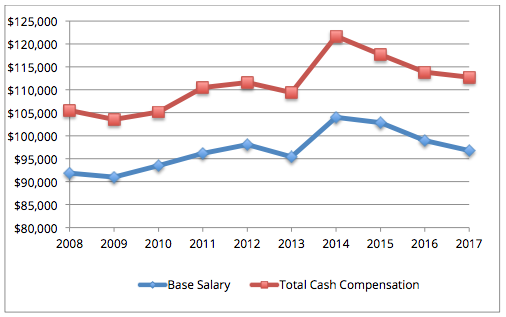 Although the third successive year of negative numbers, the downward trend in total compensation is moderating. Last year’s survey showed an overall dip of more than 3% in base salary. Survey participants expect a more lucrative future, however. 71% of survey respondents received a raise in the past 12 months – up from 2016 (66%), and 77% expect their base salary to increase this year. More than half of respondents (57%) also expected their bonuses or other incentives to repeat in 2017, with only 10% anticipating a decrease in incentive compensation. Russell Broome, managing director of Society of Plastic Engineers added, “There are external influences that tend to make me lean more on the optimistic side for employment in the plastics industry…We are entering a very manufacturing friendly environment with less regulation. This coupled with the fact we are entering another NPE cycle is critical in supporting continued growth predicted by the survey.” Consistent with recent years, about two-thirds (64%) of managers predicted their employees’ compensation will increase by 1-3% in 2017. Employee loyalty remains high though, with 72% satisfied with their current employment. Additionally, 70% of respondents agreed with the statement, “My company is a great place to work.” Ultimately, despite minor decreases in compensation, the plastics industry sees the future as bright, and employees are optimistic about their growth opportunities in 2017 and onward. A detailed report of the full survey will be available in an upcoming issue of Plastics Engineering magazine produced by SPE. Members of SPE can obtain a copy of the 2017 survey, with detailed information, by logging into their accounts at http://www.4spe.org.